Hardinge, Inc. brings innovation, precision, and accuracy to the most demanding metal-cutting applications. Simply said, they sell big machines and the parts that make them work. An international manufacturing provider of advanced metal-cutting solutions, Hardinge offers a full spectrum of highly reliable CNC turning, milling, and grinding machines, as well as technologically advanced workholding and machine tool accessories. Its global footprint spans 65 countries and 6 continents and works in the aerospace/defense, automotive, medical, and mold & die industries. 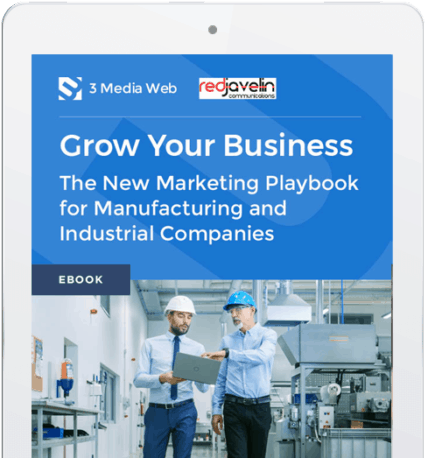 3 Media Web was brought in by Red Javelin Communications, a marketing & PR agency focused on emerging growth, B2B, and industrial companies, to handle the website redesign. Red Javelin was charged with helping to centralize the company’s global marketing efforts, new messaging, website content, as well as to provide ongoing PR support. Red Javelin worked to identify key buyer personas and developed a messaging blueprint as a basis for the company’s corporate communications. 3 Media Web inventoried all the Hardinge company websites to create a master template to ensure that the required functionalities for all brands were included in the new website. Red Javelin worked to refine the navigation to be more aligned with its personas, was involved in project and client management, and created new website content across the new site. 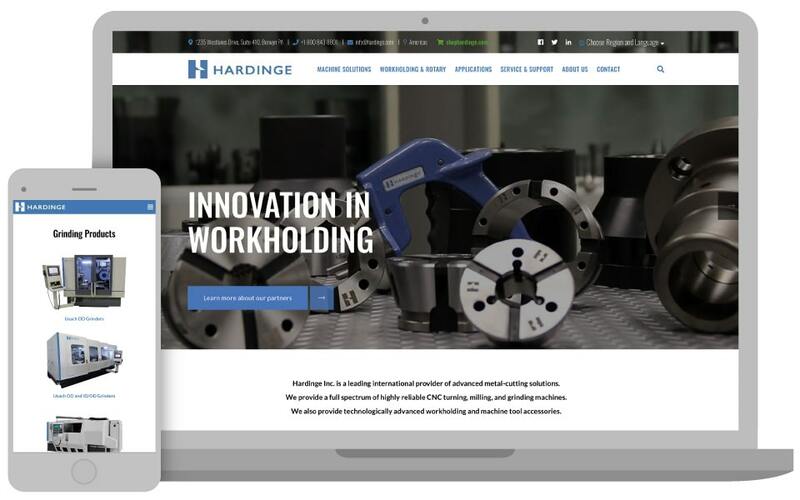 3 Media Web inventoried all the Hardinge company websites to create a master template to ensure that the required functionalities for all brands were included in the new website. The master template features “modules” with specifications for images, text, page bands, sliders, testimonials – everything needed to design a page. The Hardinge master website now has the flexibility to add pages for newly acquired companies that maintain the uniform design and provide the specific functions each requires. The tight design of the new website conveys the comprehensive story of Hardinge, Inc. whose expansion is worldwide and growing. With rapid growth, a series of acquisitions and various well-known brands under the company’s umbrella, Hardinge was challenged with managing over 25 different websites, many operating as stand-alone entities across various regions in the world. Hardinge wanted to create one global website that would unite all the Hardinge brands and provide one global brand identity. A key goal was to centralize its various sites, improve key customer touch points, and make it easier for customers and OEMs to do business with them. In addition, they wanted a site that could grow as Hardinge adds new brands while maintaining their individuality. Hardinge also wanted to create a consistent message and increase visibility for the company with a PR program. The HOME page features a “hero” image slider that immediately gives the web visitor a glimpse of the variety of solutions the company offers. Multiple links bring the web visitor where they need to go efficiently and quickly. Whether browsing the site or searching on application or industry or by brand or product, the reader receives comprehensive information and calls-to-action. Hardinge, Inc. works within the Aerospace/Defense, Automobile, Medical, and Mold & Die, industries worldwide. The website features each industry and the brands and products specific to them. A key goal was to add foreign language translations for the company’s international audience and to accommodate their customers all over the world. The Hardinge, Inc. website opens with a prompt for the visitor to select a region and one of 10 languages, including four Asian languages for those in countries where Hardinge, Inc. has had the most growth in the last decade. Foreign language translations were achieved with an integration to a cloud-based translation service that localizes all their content. The Home page main navigation bar links the company’s key product lines to a page that shows a specific machine operation (for example: grinding) and then drills down to information with specific types of grinding applications … to brands and a product slideshow … to a brand page with a Call-to-Action, technical data, features, and controls … and finally, to a brand catalog that can be downloaded. The About Us section leads with an image-only video which shows, without narrative, the company today as well as its beginning more than a century ago. A sub-page features a graphic Timeline in Who We Are that illustrates the history of the company since it began as Hardinge Brothers in the 1890s. Biographies of key management are included here, as well as an invitation to job seekers to join the Hardinge family and a link to the listing of all the company locations. With so many locations, the Contact Us page was designed with efficiency in mind. There is a sales representative search by zip/postal code and an Information Request Form that collects significant data. In addition, there are links to headquarters and Hardinge locations in the Americas, Asia, and Europe. There is also a link to an email form for convenience in contacting the company. Working with Red Javelin, 3 Media Web created an efficient and easy-to-navigate website that unifies multiple brands, conveying the comprehensive story of Hardinge, Inc. and achieved the goal to build a website that will grow as Hardinge adds new brands.